We’re all familiar with the principle that warm colors advance and cool colors recede. 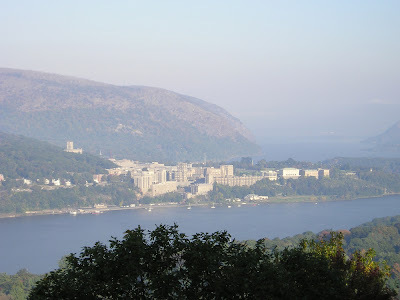 This picture of West Point from a few miles away is a good example of the way the warm colors tend to drop out in the distance, and the darks become progressively lighter and cooler. But in wonderful, rare instances, the rule is reversed, and the whole scene gets warmer as it goes back. This happens when moist vapors or dust clouds hover in the air near sunrise or sunset. You have to be looking directly toward the sun to see it. The color of bright or white objects, like the sun itself, becomes increasingly orange-colored as it recedes, because the blue wavelengths are subtracted out of it. I took this photo recently in the Catskills--no filters or Photoshop whatsoever. The effect lasted only a short time. This painting, called “Light on the Water,” from Journey to Chandara, explores this strange phenomenon. The foreground is actually cooler than the distance. The light of the setting sun spills out into the surrounding atmosphere, warming the outlines of the towers in the distance. The vertical bar of reflected light in the water melts the silhouettes of the boaters and swimmers nearby. In my clipping file I have a folder of photos with a variety of atmospheric color progressions. Some of these might have been manipulated by filters or image processing. When I'm painting, I also refer to my own plein air studies, and if you're interested I can show you some more of those in future. These types of painting are beautiful, but confuse me when it comes to applying warm/cool colors. In your painting, "Light on the Water", the sun color is very warm. But the back of the main dinosaur has cool colored light from a secondary light source, the sky, right? This shadow side of the dinosaur seems to be mixtures of warm and cool colors. Is it just the reflected water of the sun that causes this? Or is it this time of day that causes mixed colors in the shadow? In an overcast day, such as your painting, "Sun in the Garden", the light on the top of this dinosaur looks cool, but the shadow colors under his front legs looks warmer with traces of cool colors too. So is this painting also near the sunset time of day with an overcast? Or should I just be reading this dinosaur as cool lights with warm shadows? Yes, the cool light on the dinosaur in the water is from the dome of the sky, which is still quite cool at sunset. The garden scene is set in late morning with diffuse high clouds, not quite overcast, but the light is less directional and fairly cool. The shadows can take on the complement of the key light even if there's no strong source of reflected light filling them. Thank you very much for your response, Mr. Gurney. I really appreciate it. Dawn and dusk can demonstrate this principle in some cases. Actually, the my favorite subjects on your blogs are the plein air paintings...I love studies and sketches from the field.